Businesses run on dreams, try to sell quality products, and work to make sure that every customerâ€™s visit is fun.Â The people who own businesses are proud and, if theyâ€™re doing a good job, their employees are proud, too.Â A business, in this sense, can come to embody the ideals of the American way of life: Belief in a better future, building communities, and showing pride in oneâ€™s labor.Â But the day to day realities of any commercial operation, however, tend to involve matters that are seemingly trivial.Â These include taking inventory, balancing budgets and checking the books, and even cleaning the shop.Â It also includes maintaining all the equipment that shop might rely on.Â This includes things like printers, computers, and, of course, registers. At first glance, well, at first glance no one ever notices the register.Â Thatâ€™s probably because it seems to be the one piece of equipment a store has that never seems to break down or be out of serviceâ€¦ Until it becomes so overlooked that someone forgets to buy thermal paper for it. Unlike machines that use ink cartridges to print, most registers, as well as business calculators and other adding machines, use thermal paper to create receipts and other records.Â The advantage of this paper, which is chemically treated in a way that causes it to change color when exposed to heat, is that it allows machines to print on it without the need for expensive inks and toners.Â This ultimately lowers costs for business owners and extends the lifetime of their counting machines.Â Unfortunately, this supremely reliable technology is occasionally overlooked by managers who then find themselves having to find replacement rolls before the next business day. We understand that essential stock can be overlooked, including various types of paper, bags, and packaging supplies.Â For this reason, among other products, we always keep the same paper that works in your register on hand.Â We currently offers these rolls in sizes that fit any machine, including 1 3/4â€ 8091 CS and PK, 2 1/4â€ 8909 CS and PK, and 3 1/8â€ 8007 CS and PK rolls. Small shops can be charming, especially those in the country.Â Theyâ€™re often filled with antiques like rusted signs, corroded bells, or porcelain dolls.Â They may even have a clerk behind the desk that knows everything that can possibly be known about the nearest town.Â More often than not, the items they sell also have price tags that have been stitched on by hand.Â That nice clerk behind the desk probably did them all and, no doubt, they didnâ€™t mind it, but theyâ€™ve also probably only had to deal with four customers all day.Â What if they had to deal with a hundred and, on top of that, saw all the goods in their store turn over every three weeks? They couldnâ€™t handle it.Â They probably couldnâ€™t even handle it if a second person was helping them run the shop.Â How, then, could clerks in a busy Chicago-area boutique, jewelry store, or other purveyor of fine goods keep up with tagging if they had to apply each and every price tag by hand?Â They couldnâ€™t, which is exactly why every store that sees even a moderate level of business needs tagging guns. Such tools make placing tags on loose items, like clothing, easy.Â They simply use a plastic barb to attach a tag to its associated item.Â Using them is also simple.Â The two models we carry, the Red Arrow YH-11 and the Tachit 2, work exactly like water pistols.Â They make tagging a simple â€˜point and squeezeâ€™ experience any high schooler on summer break can master with one try.Â For any shop thatâ€™s starting to see more sales theyâ€™re an essential time-saving tool. If a business already uses tagging guns, however, it may be interested in buying more as it expands its workforce and inventory.Â Weâ€™re happy to supply such an enterprise with these and other basic supplies, such as labelers, plastic bags, and other forms of packaging. A sale often begins with a smile, but a smile is only convincing if it is backed with confidence.Â A sales clerk, especially one who is new to retailing, will not have a strong sense of that confidence if they are standing behind a weathered or undignified looking cabinet.Â They might not have it at all if, without a case to hold their merchandise, they have been reduced to constantly rearranging and cleaning the items theyâ€™re hoping a passing customer will notice.Â Even worse, they might not have as much faith in those products if they look haphazard or dirty due to their not being safely secured within a case. 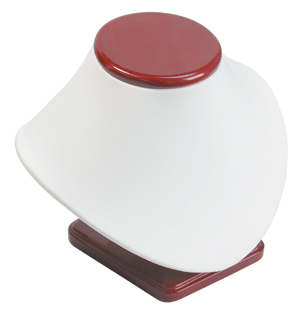 For these reasons, a quality countertop display is essential to sales, especially for stores that specialize in small, quality items that must retain their beauty at all times.Â Jewelry will not sell, nor will it even attract up market buyers, if it is loosely arranged along a countertop.Â Such items, even if they are inherently elegant, will not have the same allure as a fine piece of craftsmanship thatâ€™s being both preserved and safeguarded behind a plate of tempered glass.Â The value of items like these, be they antique coins, exotic toys, or a set of diamond earrings, is enhanced, even, by the moment in which the sales clerk slowly removes them from the case and, as if revealing a mystery, first shows them to the potential buyer. A countertop showcase, however, can only add to the likelihood of a sale if it is both sturdy and dignified.Â Our countertop display cases are manufactured with aluminum radius edged frames and key-locks, granting them a strength and resistance to corrosion or theft that isnâ€™t found in plastic showcases.Â They are also fabricated with sliding doors made of tempered glass that easily resist the discoloration and scratching that often make cabinets molded from transparent plastic look undignified.Â Finally, our displays, which come in three different sizes of 30″ x 18″ x 9″, 14″ x 12″ x 27″, and 24″ x 12″ x 18″, are each available with either a silver or pewter finish, making them a fit for the dÃ©cor of any shop or boutique. Whether a place of business is showcasing jewelry, sports collectibles, or antiques, its clerks and sales representatives will always have the added confidence needed to greet a customer if they are standing behind a sturdy and elegant showcase. Jewelry isnâ€™t just gems and bands of gold.Â Itâ€™s a present, a token of affection, and possibly a symbol of love thatâ€™s exchanged between two people at a special time in their lives.Â It has meaning and value that goes beyond the price of stone and metal.Â For this reason everything about the moment in which a set of earrings, necklace, or ring is bestowed upon someone has to be perfect, including the box it is presented in as the second in which that box is opened will never be forgotten by either person.Â For some it will signify an anniversary, for others a great achievement, and, as with a moment in which a jewelry box is opened to unveil a ring, the most joyous of all beginnings. We offer boxes that are appropriate for any jewelry or delicate pieces that might be a part of such special moments.Â Retailers can choose from a wide selection, in terms of type, styling, and size, to accompany whatever precious goods their shops might sell.Â These include boxes that are specifically sized for necklaces, earrings, bracelets, and rings.Â In particular, we carry lines of cotton filled, regular and flower bow tie, velour, crystal, faux leather and wood, and premium rosewood jewelry boxes.Â Our cotton filled boxes, in particular, are perfect for shops that carry items other than jewelry, as their padded, pliable interiors are a great fit for antiques, coins, and other irregularly sized collectibles.Â Wrapped in small ribbons, our line of linen, pearly, or flower bow tie boxes, which come in colors ranging from light whites and pinks to striking blues, are a soft and feminine fit for any gift that is expected to charm.Â Though jewelry is usually given with an element of surprise in mind, those wishing to let their loved ones in on the secret just a second early might be interested in our Crystal Jewelry boxes. 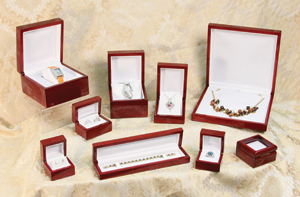 Sometimes jewelry boxes are counted on to carry rings or other valuables that are expected to symbolize the test of time.Â For this reason, our velour and premium rosewood boxes convey both the certitude, durability, and gentle grace that is expected to accompany moments that mark graduations, anniversaries, and, of course, engagements.Â For any retailer who deals in valuables that are expected to be a part of such passages in life, strong and beautiful boxes like these are an essential part of their trade. Sometimes shopping is meant to be a little reward that is granted upon the self for no particular reason.Â There are, of course, many times when a special occasion calls for a magnificent new necklace or a set of earrings, but just as often a quick trip to the boutique or haberdasherâ€™s is meant to drive off the blues of a rainy day or burn time before the next show starts.Â Itâ€™s times like these, when people are simply browsing, that small displays can bring items to the forefront that might pick someoneâ€™s day up a little. 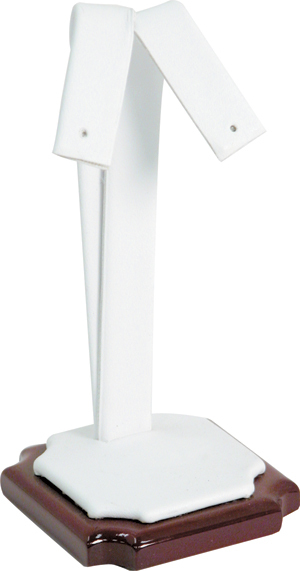 Weâ€™re happy to provide retailers with a diverse selection of acrylic displays.Â This is because we know that, more often than not, good business depends on purchases of small items.Â This includes the woman on her way home from work who might find a fun set of earrings on a T-bar inside a shop near her train station or a tired gentleman who is looking to replace his weathered old wallet and finds a new one with the perfect combination of ruggedness and style on the riser by that shopâ€™s clerk.Â It also includes the high school-aged girl who is out with friends and just happens to bump into a colorful set of necklaces on a slatwall. 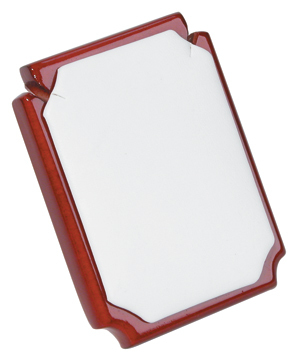 Acrylic displays, whether T-bars, riser, earring, or necklace displays, are perfect for this sort of casual buyer.Â We know, however, that many retailers love the way acrylics, due to their transparency, allow many layers of merchandise to be viewed at once.Â For this reason we carry durable displays that will not easily crack or discolor.Â When paired with a dark background, even, our fine displays can make jewelry and fine accessories seem to drift in the air.Â This illusion of weightlessness is ideal for displaying jewelry that features large, bright gems under indirect or diffused lighting conditions. Since many high end boutiques use just such staging, we take care to only supply our customers with dignified and durable displays.Â However, we also never forget that even the local corner shop that might be selling earrings or wallets to that woman or man on their way home from work or the proverbial teenage who is out on holiday with her friends will want displays that are just as elegant as those in the finest galleries. There are few experiences in life worse than that of having saved money to buy something of beauty, something that is intended to make a loved one happy, only to arrive home and find, whether it is jewelry, a Victorian antique, or some small work of art, that its delicate lines and details have been scratched or broken while being carried back from the store.Â This sadness can be especially profound when such an item is meant to commemorate a special occasion or anniversary.Â Though the shopper and would-be gift giver is let down by moments when a precious gift is marred by crude packaging, the retailer, as well, feels unhappy knowing that an item they have sold someone, an item that they selected for their store due to its uniqueness and quality, has lost value almost as soon as its transaction was completed.Â For this reason cotton jewelry boxes are more than just an attractive way to store a valuable item: Theyâ€™re also essential for protecting that value. Many items that can be purchased at a fine retailer will have secure, sturdy boxes that come from the supplier with the product.Â There are many products, like antique pins, sports memorabilia, coins, or after-market jewelry, that the retailer may have purchased without an accompanying case, however.Â To help with the display and transport of such items a type of padded, yet dignified and appealing, box is often necessary. We currently offer a wide variety of cotton filled jewelry boxes, both in terms of size and styling.Â These include the reserved, modest Glossy Black and Pinstripe lines, which work well with items intended for both men and women, and the more noticeable Zebra and Leopard Print boxes.Â Our White Swirl, Brown Kraft, Silver and Gold Foil, and Pastel boxes are also popular with various types of retailers and specialty shops.Â All, of course, are noted for their sturdiness as well as their eye-catching designs, as each is lined with fine, shock-absorbing cotton fiber.Â Each series is also available in a wide selection of sizes, ranging from 2 5/8″ x 1 1/2″ x 1″ to 7 1/8″ x 5 1/8″ x 1 1/8″. 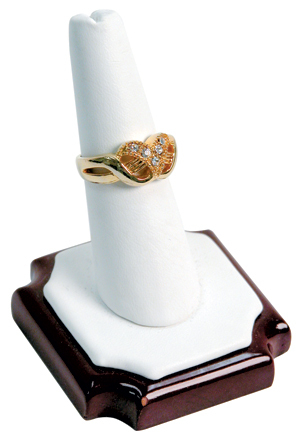 Both retailers and shoppers want to protect a recently purchased valuable.Â As such items are often gifts they must also be guarded within a box that projects the professionalism of the store from which they were purchased and the thoughtfulness of the purchaser.Â Ours do this with both class and elegance. For many people shopping can turn into a full dayâ€™s work.Â Theyâ€™ll go from one shop to another or, even if they only stop at one retailer, might make a day of it with their friends and relatives.Â This means they could find themselves eating at a fine restaurant, sitting by a fountain downtown, or even waiting with others for the train.Â They will, however, be with other people, be they familiars or strangers, throughout the day, and so theyâ€™ll also want to carry the wonderful items they just purchased in a tote that is both classy and fitting for someone who is out on the town.Â The need for such attractive bags is all the more important if the buyer intends to use them in lieu of gift wrapping, as even the most majestic present can seem less so in an ugly or flimsy tote.Â For the retailer, as well, the quality of the packaging they put their sale goods in is important because, other than the natural desire to provide a thoroughly elegant shopping experience for their customers, they also know that anyone that shopper meets at another store, restaurant, or even on the train might first be introduced to their own products by the bags they are being carried in. Our fine line of shopping totes is designed for the retailer who is committed to providing their customers with this type of complete buying experience.Â Just as they want their patrons to feel comfortable while shopping, they also want any goods that have been bought to be carried with the pride and happiness that comes with a satisfying purchase.Â For this reason we offer a variety of boutique shopping bags, including Frosted Totes, which have rope handles and reinforced bottoms, elegant Frosty Shoppers, which are made from high density plastic, Teal Blue Glossies, which come with personal gift cards, a series of assorted Pastel Totes, and the eye-catching Zebra Totes. In addition to these stylish lines, we are proud to offer a series of recycled paper shopping bags.Â We realize that our customers are both environmentally conscious and in need of bags that can withstand the wear and tear their patrons might experience during an otherwise perfect day of shopping. 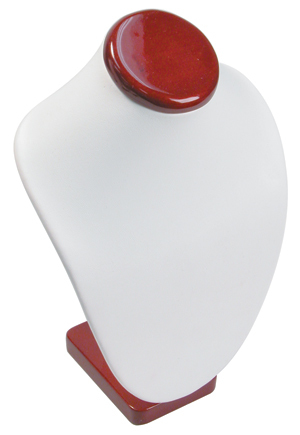 Our Rosewood Display and Rosewood Jewelry Box Collection caters to our high end, fine jewelry retailers. The combination of white leather and deep rosewood enhances the beauty of white, yellow, and rose gold, as well as diamonds and precious stones. Lighting can play a significant role with these displays, as it carries the ability to shine against the glossy rosewood trim of each display.